Have you ever had that burning question about your class? Ever hated it when you see interviews and Q&A's that just don't answer what you want to know? Well, here's your chance to set the record straight! From now until Friday, March 16th we'll be accepting questions from the community to submit on our Class Question Q&A to the Trion Developers. But that's not all! Enter your relevant, unique and productive question and you have the chance to win one of four 30-day game-time cards (one per calling) or 30 days free Magelo Premium service. This is a Q&A session that is all about you, so don't miss your chance! Submit your question and its class in our contest thread. On Friday, March 16th at 9pm PDT we will close the thread and select the winners. These questions will appear at the top of the list of questions for your class, recognized by your free Magelo username. The person who submits the best and most unique question for each calling will earn a 30 day game-time card and 30 days Magelo Premium service. The second prize winner will receive 30 days Magelo Premium Service. Winners will be notified via email and receive all applicable codes and instructions. On Monday, March 19th we will announce the final Q&A on the General Discussion at Magelo Rift and notify all winners (follow us on Twitter: @Magelo, Facebook: Magelo). 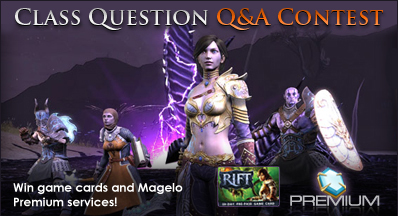 Once the questions are answered by Trion Staff, we will post the entire Q&A as a news story on Magelo. If your question isn't selected as a winner, fret not! We will be canvassing all submissions for quality questions to submit to Trion. > Learn more about the contest now on Magelo!